When we lived in Japan we were frequent visitors to the Tokyo Sea Life Aquarium. There you could visit sea creatures native to that region of the world. And then after seeing all the cute little sea urchins, you could go into the Aquarium's restaurant where you could then order them for lunch. It was very disturbing. 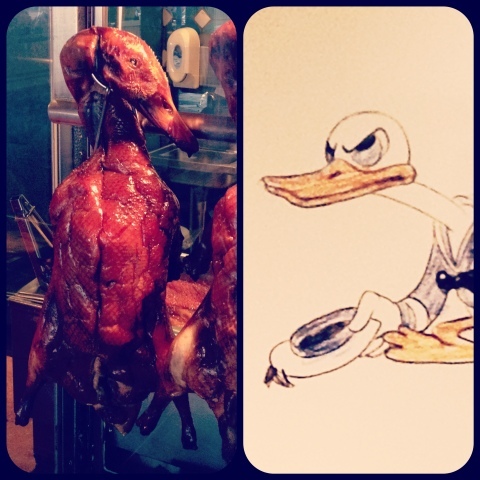 Throughout Macau you'll find shops and restaurants with full cooked chicken, pigeon, ducks, and geese hanging in the window ready to be cut up into your meal. Feet, beaks, bills and all. As Americans, unless you grow up in the country, you tend to be pretty far removed from your meat in its more natural state. If you buy a whole chicken in the States, you get a neatly trimmed bird without a head or feet. It's much more difficult (for me) to buy poultry here where the whole chickens have eyes. I'm getting used to it, but it never ceases to make my old vegetarian lifestyle start to look more and more appealing. Today at Disneyland I felt a flashback of our time in Tokyo. We visited our pal Donald Duck, and then went to lunch where right at the counter we were confronted with duck as a meal option, hanging right in front of us. Guess what? I had the char siu BBQ pork and the boys had shrimp fried rice. Just couldn't eat Donald. Not today anyway. I had him for lunch today with steamed rice and his buddy, roast pork. It was yummy. Trust me, this duck is sooo yummy!